McClellan's 'I can do it all' statement to his wife regarding his ability to be both the commander of the Army of the Potomac and co-ordinator of all the field armies of the Union contrasts well with Burnside's hesitancy and reluctance in accepting the position of commander of the Army of the Potomac. Also, McClellan's decision to move the army as wings worked well but immediately before a battle he dispensed with the grand division command and relied on his corps commanders. Conversely, Burnside, who also used the grand division command system to move the army, kept the wing commanders during the battle of Fredericksburg. This decision was a detriment to the successful completion of his battle tactics, especially during the Prospect Hill attack. Franklin's non-support of Meade, as Burnside ordered it, is a case in point. Additionally, Franklin allowing Reynolds to focus upon the artillery and not his troops, worked to the disadvantage of the Pennyslvania Reserves under Meade. Faced with the delay of the pontoons, Burnside waited until all was ready. McClellan may have done the same. Faced with similar situations, such as Yorktown, and June 1862 in front of Richmond, and after Sharpsburg, McClellan was deliberate and constantly addressed the issues of readiness. I suspect that faced with the delay of pontoons at Fredericksburg, McClellan too would have waited until they arrived. But instead of attacking over them, it appearsly probably that McClellan would not have attacked at all. Of course, McClellan may not have chosen Fredericksburg as a destination in November, 1862. Though, he successfully managed to get the Army of the Potomac between the wings of the Army of Northern Virginia in late October and early November, Rafuse is unsure what course McClellan would have taken if he would have stayed in command during November. 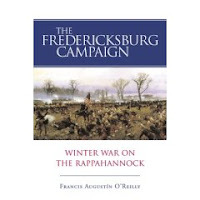 O'Reilly's choice of adjectives on several occassions in 'Winter War on the Rappahannock' lends a degree of triteness to his writing style. Fortunately, he holds close to the primary sources and quotes observers' impressions of Burnside as the battle slips beyond his grasp. A condition 'akin to desperation,' 'unbalanced,' 'dead with sleep,' having a 'great nervous exhaustion' led to Burnside's decision to personally lead the next day's attack. Stamina appears to be a major difference between McClellan and Burnside. McClellan kept his head during his times exhaustion though during these times he had the tendency to shove blame upon others shoulders. Burnside lacked the stamina that McClellan had, but Burnside did have a positive characteristic that McClellan did not have. He could accept blame and admit his faults. I can not recall an instance when McClellan accepted blame and admitted his faults, after reading Rafuse's 'McClellan's War'. McClellan's War: The Failure of Moderation in the Struggle for the Union, Rafuse, Ethan, Indiana University Press, 525 pp., maps, illustrations, notes, index, 2005, $35. Rafuse cites Grant as remarking during the 1870s that McClellan 'is to me one to the mysteries of the war.' Did Grant intuit that McClellan was old-fashioned and unwilling to fight a war without moderation? Possibly Grant understood McClellan to have psychological problems that rendered him ill-suited for the task at hand in 1862. Was Grant prescient regarding historian's judgement of McClellan? Cultural environment and family environments made McClellan essentially different from both Grant and Burnside. The Market Revolution during the Age of Jackson, upward social and political mobility and post-Mexican War nationalism are elements which are present in McClellan's life, much more present than in Grant's life, and somewhat more present than in Bursides' life. Rafuse presents these dual environments, cultural and family, as being the seed-bed for McClellan's faith in elnightened reason, critical moderation, and the rational direction of activities. 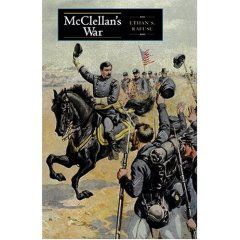 An attachment to order and hierarchy and the rigorous practice of deductive reasoning from established principles to the significant details of campaigns is the hallmark of McClellan, the man and soldier. If Grant had known McClellan as thoroughly as Rafuse does, McClellan would not have been a mystery to him. Grant's cultural and family environments were very different from McClellan's. Burnside's cultural and family environments were only somewhat different from McClellan's. Though having West Point in common, upon graduation all three took different lessons away from it. During the Winter Campaign of November 1862-January 1863, things that went wrong for Burside (besides have Franklin as a wing commander) include the over-attachment to his plans in the face change, unfamiliarity with some the established principles of warfare, and his inability to reason deductively rather than inductively. Both Rable and O'Reilly present the activities of Burnside in the light of this failure to reason deductively, which includes the ability to gather information on the enemy and assess it with an eye to changing plans.